Similar to our read aloud last year, my teaching partner Clarence Fisher or I read the novel to the students via Skype or on our radio station, 105theHive. One of us interacted with the students in the chat room while they listened. At the end of each reading, students posted their comments and reflections on an online sticky note. You can find links to all the chats and reflections on the Idea Hive site. Throughout the readings, students were asked a variety of thought-provoking questions including whether or not they agreed with the researcher’s distant approach to Zan, or life lessons that emerged as the characters developed. Some questions dealt with the humourous sections of the story as Ben attempted to win a girlfriend and so they provided relationship advice for Ben. What similarities and differences do you notice between Half Brother and Project Nim (characters, story line, setting etc.) ? What surprised you most in the documentary? What were you most disturbed about? What were you happiest about? What did you learn from the documentary that you hadn’t thought of before? After students had commented on each others’ blogs, they had questions surrounding the ethics of animal testing, so we asked a local veterinarian, Dr. Suzanne Baird, to address these. Dr. Baird visited our Wingham classroom and both classes listened to her either live or via 105thehive and a chat room. Dr. Baird provided a very balanced approach to the topic. Students learned not only about regulations regarding animal testing as well as the advances in human health that have come as a result. You can listen to the entire broadcast: Interview with Veterinarian, Dr. Suzanne Baird. Following her visit, students raised money by selling freezies at their annual ball tournament. This money was donated to Dr. Baird with the students’ request that it be used for the treatment of an animal where finances were limited. 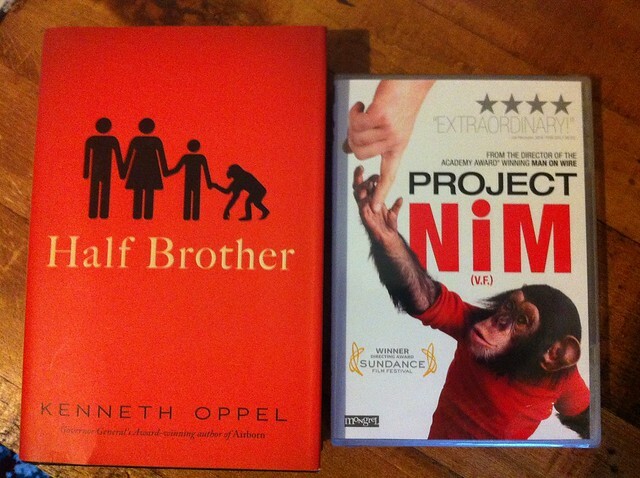 Half Brother paired with Project Nim not only engaged our students, this project forced them to address some powerful, challenging questions regarding issues of animal testing. It strengthened their compassion for others.